I’ve been doing some tentative thinking over he last few weeks about how we might transform our spare room into a nursery. We virtually have a blank canvas as the walls are white and the only “colour” in the room comes from an oak door and the wooden beam which runs the length of the vaulted ceiling. Oak and white are a combination that many of us have in our homes, particularly as wooden floors grow ever more popular and mid-century furniture designs appear again on the high street. I like the inclusion of wood in a home as it gives warmth and a connection to the outside and works well with many other colours. Oak furniture is also pretty timeless. The oak chest I have included below would work equally well in an adult bedroom as a child’s nursery. For my nursery mood board I have mixed my two basic colours with mint green and yellow to give it a gender neutral and contemporary twist. This look would work well for those who find they are putting together a nursery with inherited items that are a mixture of wood or white finish. In fact we have exactly this situation, as the small amount of furniture we have to pass down from Theo is a mixture, with a wooden cot and a white changing table. Are you planning a room revamp this summer? If so well you be including wood in your scheme? 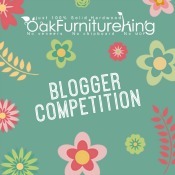 This post is my entry to the Oak Furniture King competition at The Oliver’s Madhouse. I am with you on the warmth of oak and the flexibility of being able to use any colours.